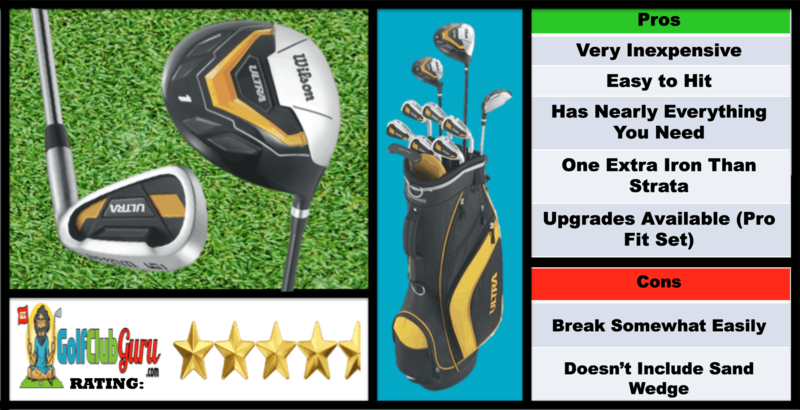 Incredible sale today at Callaway Golf Pre-Owned! 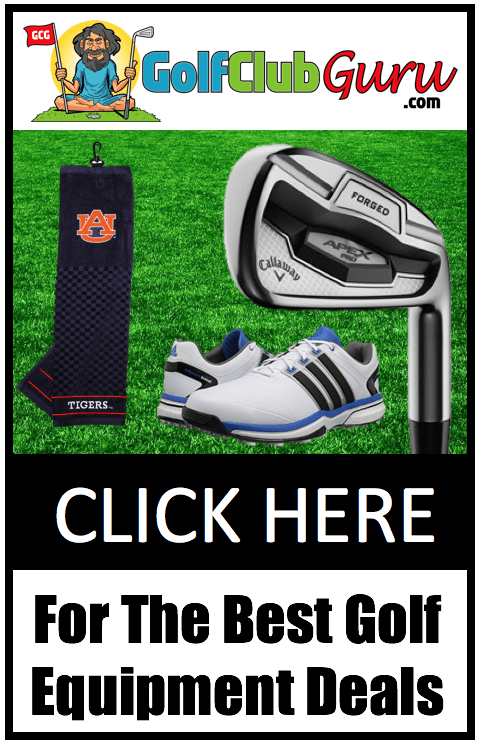 Click here for 40% OFF on lots of clubs! I’m super excited and thankful for everyone that has opened this post and decided to give it a read! Why? Because odds are, you are a beginner and golf could potentially have a large impact on your life in the future, and I’m glad I can be a part of picking your first set of sticks for the course! Let’s get right to the meat of this topic: finding the best full set of golf clubs for beginners! 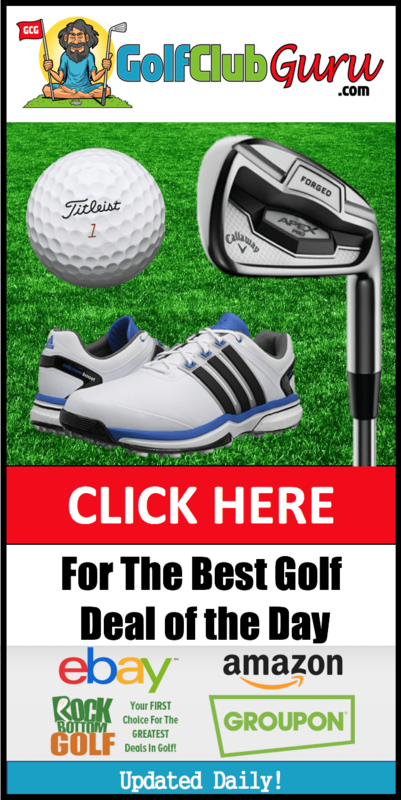 The only time I would recommend a full set of clubs is for someone who is just starting the game of golf, and is not sure if they are going to play very often in the future. 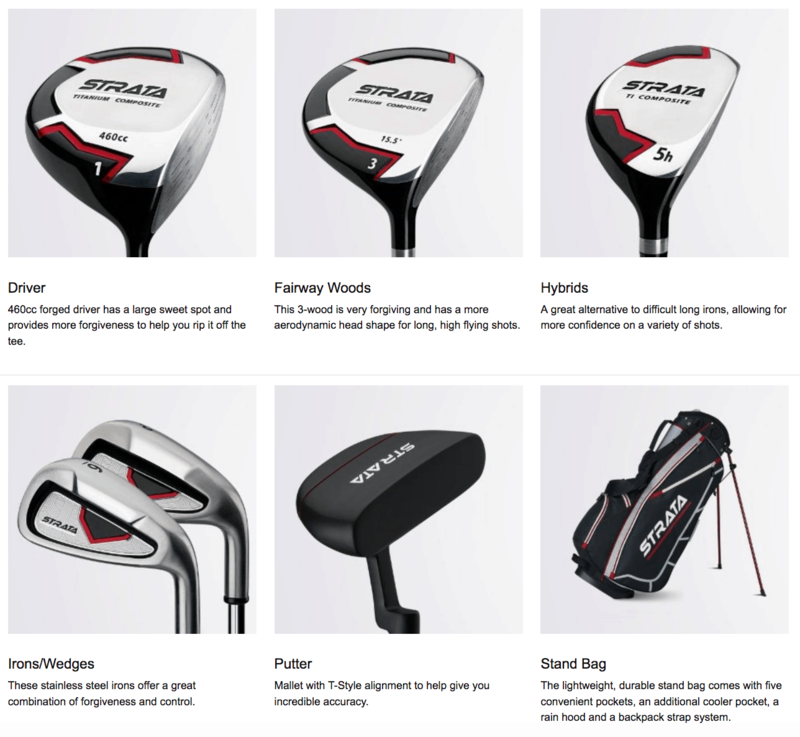 If you are planning on playing many rounds of golf in the future, I would recommend looking at my other posts about picking the best budget driver, fairway woods, hybrids, irons, and wedges (don’t worry, it’s not going to be as expensive as you might think!). So, if you are not sure that golf is going to be a sport you take very seriously in the future, and instead just want some clubs to hang out with friends and have a good time, a full set of clubs would be your best option to buy! Forgiving Clubs: As beginners and high handicappers, it’s hard to consistently hit the center of the clubface. As a result, you need to look for oversized clubs, which offer a wider margin for error (it’s OK to miss the face by a couple inches on these clubs, which isn’t true for some sets). 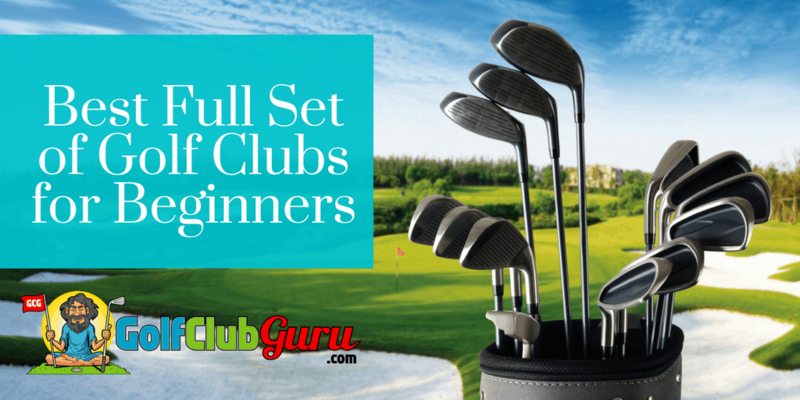 All the Clubs That You Need: As a beginner, you need a driver (for tee shots on long par 3s, par 4s and par 5s), a 3 wood (for long shots into a green and sometimes off the tee), a hybrid (for long shots into a green where 3 wood would be too much and irons wouldn’t be enough), irons (for medium length shots into the green), a wedge (for chipping, pitching, bunker shots, and short shots into the green), and a putter. Lightweight Carry Bag: The cheapest way to play golf is to walk the course, so make sure you get a lightweight carrying bag, which all of the following 5 have, to save you energy. Here are the best complete sets that you can buy in 2018. 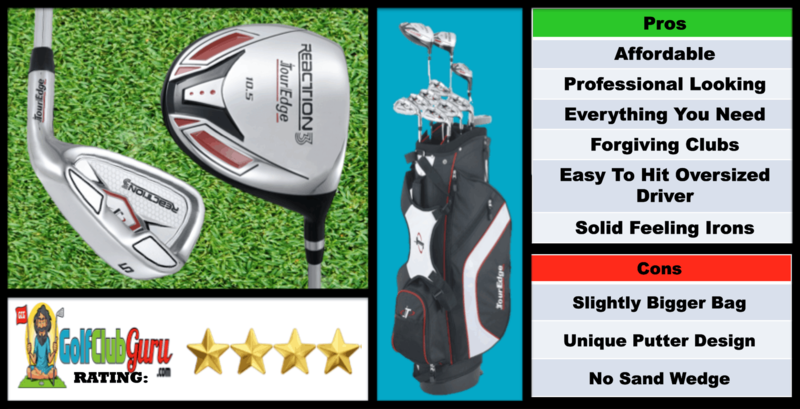 Depending on what you are looking for and how much you are willing to spend, I know that we can find the best complete set of clubs for you! 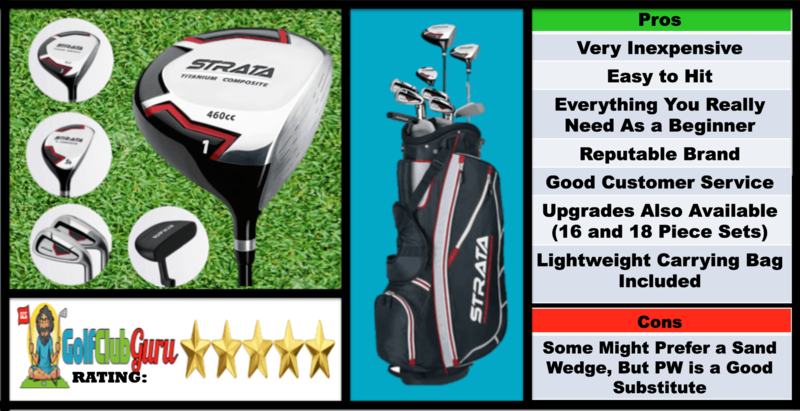 Callaway Strata is going to be your best bet for an inexpensive, well designed full set of golf clubs. 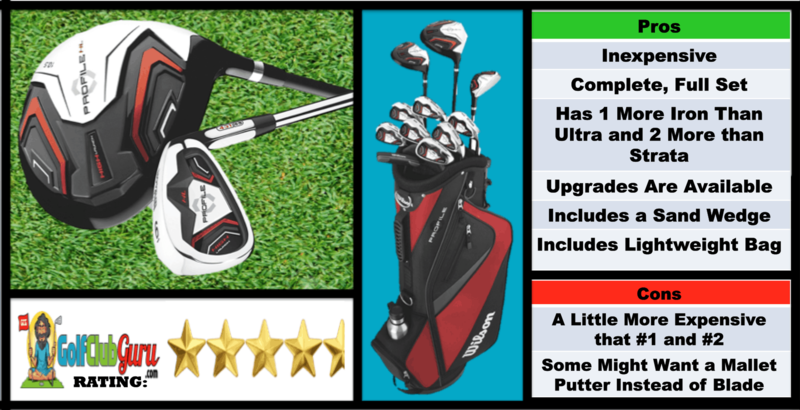 Strata is Callaway’s budget line of golf clubs, and they are actually the set that I learned to play golf with! They lasted me many years, and they were a great set of clubs to learn the game of golf with! 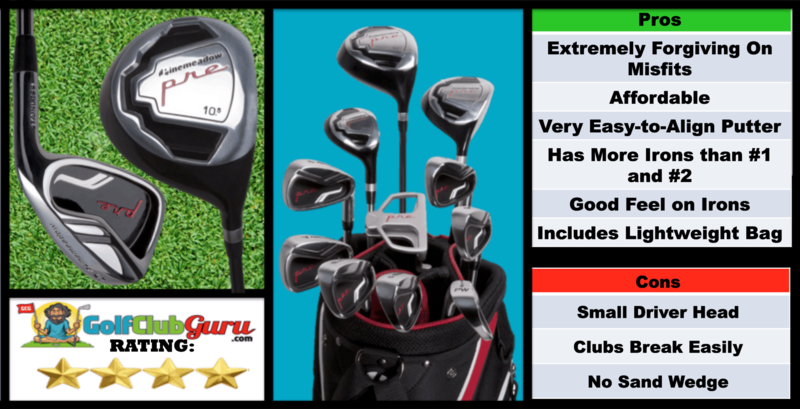 The set includes a driver with a headcover, 3 wood with a headcover, 5 hybrid, 6 iron through PW, putter, and bag. At the time, I did not find it a problem that it didn’t come with a sand wedge, as I just used the PW in its place. 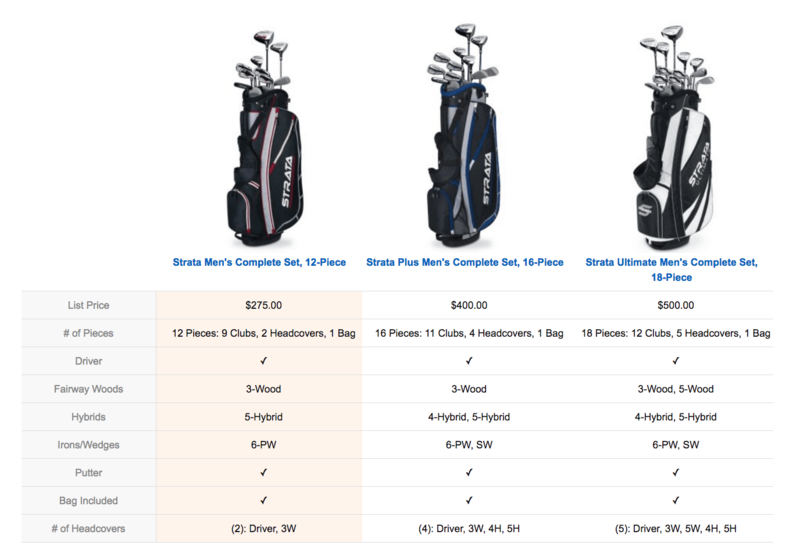 If you are willing to shell out some extra money, you might want to consider the Strata Plus Men’s Complete Set (which has an extra hybrid and sandwedge) or the Strata Ultimate Men’s Complete Set (which has an extra 5 wood, hybrid, and sandwedge; this set looks very professional for a full set). The differences between the sets is shown below. Another reason to go with the Callaway Strata Set is their awesome customer service. Others have reported that if they had a problem with any club, Callaway would instantly send them a new one no questions asked. Callaway has without a doubt rightfully owned the beginner club market for years now, so I couldn’t recommend this set any stronger! Driver: 10.5 degrees in loft, this driver has an oversized head and is very forgiving on mishits. It has a high MOI, is titanium, and is 460cc. The shaft is graphite and regular flex. 4 Hybrid: This club is used to replace long irons (3 and 4 irons), which can be difficult to get up in the air and stop quickly. Hybrids are easier to hit high and soft, and they are much more forgiving. Upgrades are also available for this club, as you can see below. 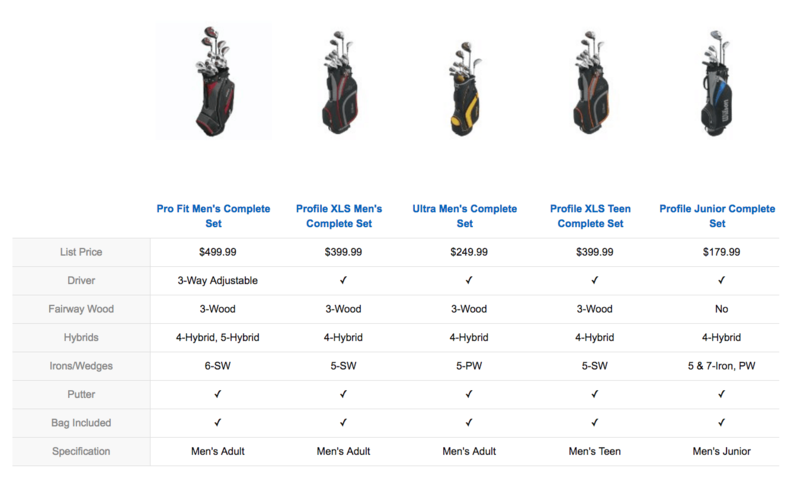 If you can pay a little bit more, you can get the Pro Fit Men’s Complete Set (which has an added adjustable driver, 5 hybrid, and sand wedge) or the Profile XLS Men’s Complete Set (which has an added 5 iron and sand wedge). A slightly less cheap set of golf clubs is the Wilson Profile HL Complete Set. This is a another set that would be great for a beginner trying to learn the game of golf. Although it is a little bit more expensive than Callaway Strata and Wilson Ultra, it contains 2 and 1 more iron respectively, and it also contains a sand wedge (the only set of these 5 that has a SW). SW: this is the only set of the top 5 that includes a SW, so that is a big plus! Although not 100% necessary, it is great to practice with a club that has “bounce” on it. Putter: as I said with the Wilson Ultra set, Wilson has a blade putter in this set. Although not a huge difference, I would recommend a mallet putter to beginners. 4-PW: This is the only set with a 4 iron in it, which can be a great addition for those that hit is higher than average and are overall decent ball strikers. The irons are steel shafted. Although no SW is included, the PW will suffice for bunker shots, chip shots, etc. The Golf Club Guru is a serial entrepreneur and golfer who enjoys teaching golf, learning web design, and writing articles non-stop. Sign Up for a FREE Weekly Newsletter! Our motto: save more money, play more golf! Best Value on a Budget Series! Subscribe today for weekly updates! Nothing more than a weekly email to help you save money and play more golf.